All New Jersey State Senators took the Pledge on Monday, December 19, 2016 at the State House in Trenton. See below links to videos from this historic event. Here is a link to the NJ State Senators taking the pledge led by Senators Lesniak and Greenstein along with the creator of the Pledge, Dr. Ali Chaudry. Click on Dec. 19 and then"View" (to the right). Speaker Prieto, Assemblyman Zwicker and Assemblyman Bramnick speak from the 7:32 minute mark to 10:25. This Pledge was launched on November 1st, 2015 at the New Jersey State Museum, in Trenton, NJ. and the second annual rally was held on Nov 1, 2016 at the Douglas Student Center in partnership with New Rutgers University, Brunswick. Here is a link to the story in The Daily Targum, the Rutgers Student newspaper. 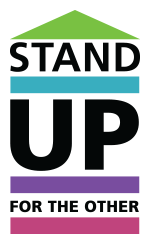 Media Advisory on the second annual rally to stand up for the other. Racial bigotry, religious persecution, Antisemitism, Islamophobia or any other form of hatred cannot be wiped out unless each and every one of us confronts it within our own circles of family and friends. Silence is seen as consent. It takes courage to stand up for the other! So you are invited to sign this pledge and invite others to do the same. We plan to circulate it in many languages and as widely as possible using social media. Help spread the word and get millions to join the campaign globally. If you would like to upload the pledge in a video, please visit our Facebook page and upload the video of your pledge, including any comments you may wish to share.